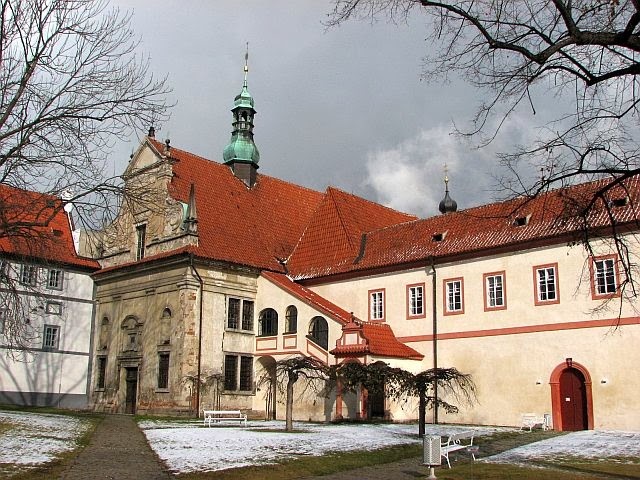 The Minorite Monastery area can be entered through a Baroque gate from Klášterní ulice (Monastery Street); behind the gate is a courtyard called Tramín. From there, you can access all parts of the area - to the Body of Christ Church, to a bigger building which is the Minorite Monastery, to a smaller building adjacent to it from the south which is the so-called Beguine Convent, and to the monastery garden, walled by a demarcating wall at the side of Pivovarská ulice, by the Renaissance part of the Brew-House and by another wall until the presbytery of the church. The monastery temple is remarkable by its early Baroque facade with a richly carved entrance door, two niches with statues of saints and a high volute gable. Baroque arrangements are decisive for the interior look of the temple. The main nave is arched by a barrel vault with sectors, as is the presbytery, where the sectors are convergent. A high early Baroque altar in the presbytery separates a two-level monk choir with organs. In the western front of the nave, a second choir with an oratory of the nobility is inserted; it is accessible by a covered arcade staircase in front of the facade of the convent. The southern wing is one half of an originally two-wing Gothic cloister attached in Baroque; it is arched by a late Gothic reticulated vault with ribs made of brick. The sacristy is attached at the northern side of the presbytery and it is vaulted by two fields of groined vaults. The furnishings of the whole church are predominantly Baroque. The cloister is accessible from Tramín by a simple plastered portal. The whole of it is arched by a rich reticular vault which is carried by supports of semi-circle cross-section and on the outside by consoles. In the separating wall at the side of the church, twisted shafts of columns discovered by probes of an originally two-wing northern part of the cloister can be seen. The space is illuminated by windows with fully conserved very rich late Gothic Rayonnant traceries. From the eastern side is the St. Wolfgang Chapel adjacent to the cloister; it is arched by one field of groined vault and terminated by a five-sided presbytery. The interior of the chapel is decorated with rich painted ornaments representing scenes from the life of St Wolfgang. The presbytery of the church is joined with the choir of the chapel by a vaulted passage continuing on the first floor of the convent until the cells of monks. The eastern wing of the cloister is on the ground level. Above the northern double-winged room is the room of the St. Bartoloměj Chapel connected by an open arcade to the interior of the monastery church nave. Above the southern wing on the first floor are flat-ceiling rooms of an ancient library with decoratively executed cavettos. The Garden of Paradise is overbuilt by the Baroque Chapel of Mary of Einsiedel. Its nave is arched by a reticular vault, its small presbytery is cross-vaulted and surrounded by a narrow passage with a staircase leading into the space over the altar that connects, via a vaulted opening, with the nave.The southern side of the cloister is inserted into the proper two-leveled convent building. The entrance is formed by a large barrel vaulted hall with a stucco mirror on the vault. From the east, there is an adjacent refectory arched by a barrel vault as well, with five-sided sectors above three window openings.Between the entrance hall and the southern wall of St. Wolfgang Chapel, there are barrel vaulted rooms of the monastery kitchen, with visible remains of a huge chimney. The disposition of the ground level is given by a barrel vaulted passage, from which one can enter singular other barrel vaulted rooms, illuminated by window openings in the southern peripheral wall of the convent. From this passage one can enter also two barrel vaulted cellars with a small Gothic portal in the separating wall. From the entrance hall, there is a staircase bent by rectangular interruptions leading up to the first floor. Here in the northern third of the disposition there is a cloister following the whole length of the building. Southward, there are seven identical monk cells with trough vaults adjacent to the cloister and other barrel vaulted rooms over the refectory. A tower is situated in front of the western facade of the convent. Its ground floor is accessible by a small portal with a Gothic doorsill, probably secondarily used. On the floor there is a vaulted room connected by a passage to the cells. The tower is terminated by a belfry with semi-circle vaulted shutter windows and by an under-molding frieze with terracotta masquarons.The so-called Beguine Convent is, as for its space arrangement, similar to the Minorite Convent. Its foundation is an originally Gothic cloister, arched by early Baroque groined vaults. In the Court of Paradise there is a simple water reservoir made of stone ( Fountains and Watering Places in Český Krumlov). The southern part of the building is rather large; there is a short one-roomed wing with an upstairs running southward from the quadratic mass of the convent. The second longer wing is running westward. The rooms of this wing, arranged for current use in the new times, have flat ceilings, as well as those on the first floor. The ground floor of the southern wing is probably formed by remains of a chapel, being separated by a large pass in the manner of a Gothic triumphal arch. A ridge portal has been conserved there as well. This part of the building is provided by three vaulted rooms. There is a remarkable graduating Gothic portal made of brick over the staircase leading to the cellars; the next cellar portal is pointed and made of stone. A curved wooden staircase is inserted into the southern part of the cloister, leading upstairs, where one enters a large entrance room with flat ceilings decorated by ceiling stucco. From there, one can enter the rooms on the first floor. In the northern and eastern part the layout of the building is one-winged, in the western part it is two-winged with a narrow passage at the side of the Court of Paradise. The southern wing has the most complicated disposition given by its somewhat complicated layout. All the rooms have flat ceilings, mostly decorated by ceiling hollow mirrors of different forms; their course indicates in most cases the secondary separation of the rooms by younger walls. The most conspicuous is the western facade of the Beguine Convent decorated by rectangular sgraffiti. The southern facade of the Minorite Convent indicates the existence of older layers with red and white or green and white color disposition. In the whole area, traces of unifying color arrangements with ochre tectonics are visible. The western part of the southern wall of the church's presbytery is unique, covered with roughly pulled plaster, probably of Gothic origin with foreshadowed rectangles.The attic rooms are free, only in the attic over the Minorite convent building there are traces of a discontinued Baroque attic built-in room (see Connecting Corridor). The constructions of practically all trusses are remarkable; they are mostly of late Gothic, Renaissance or Baroque age. In the monastery garden, there is a Baroque pavilion with vaulted, secondarily filled window openings covered with a shingled attic roof. The only inner space is arched by plastered mock-up vault supported by a carrying wooden segment construction. The construction of the Monastery started after its foundation, exactly in the mid-14th century, and was evidently very slow in progress. The temple arose probably as soon as in the 14th century, but the cloister of the monks was apparently finished only one and a half century later, toward the end of the 15th century. The St. Wolfgang Chapel was consecrated in 1491. It means that since the oldest building phase, late Gothic construction has predominated. In the Beguine Convent there are some building details indicating that it dates back to the second half of the 14th century; this is probably the court that Anna of Rosenberg willed to the use of religious women. In the second half of the 14th century, the tradition of the Festival of Relics Showing in Český Krumlov began right here. The next important phase were arrangements and new early Baroque building, started by the 1630's and soon discontinued due to lack of money. The church was prolonged westward and eastward and vaulted in 1649 - 1681. In 1668 the monastery was partially damaged by fire and some building interventions became necessary. They were carried out by the builder Jakub Maggi and lasted till the end of the 17th century. The vault of the Beguine cloister dates from the same era. In 1688, the Chapel of Virgin Mary of Ensiedel was constructed in the Court of Paradise. Since the foundation of the monastery there was a graveyard in the area of Tramín; it was used for burials until the 17th century. There was a mortuary that was destroyed in the 19th century ( History of Graveyards in Český Krumlov). On the basis of probing discoveries and archive data the today´s ground floor cloister was built around the year 1500. St. Bartholomew´s Chapel with two pointed window holes in the west wall was built on the left of the west cloister front at the same building phase. A rough plaster surface of both facades with smooth hole framing was covered in an all-surface red-coloured coat of paint. In the early Baroque period a presentable flight of stairs leading to St. Bartholomew´s Chapel was newly built at the first-floor level. The walls of cloister and chapel were plastered and a red-coloured coat of paint and grey-coloured coating to point up the plasticity of some elements (micro-analytic fragment assessments) were used. In the early Baroque period there were not any big changes, only a coloured adaptation: white-and-ochre-coloured paint. In 1777 the first floor was built on. The facade was articulated with window holes with band shams finished by a cavetto head ledge. Quite an unusual illusion design was chosen: the inter-window vertical strips of ochre-coloured rustic-work articulated with a black line linked to the ground floor ochre-coloured rustic work. Around the half of 19th century there were not any other building changes but the facade was covered in a green-and-white-coloured coat of paint and later in two all-surface ochre-coloured coats of paint. In 2000 the caruful restoration work was done and lime paint was used. A light pink-and-red-coloured combination is not based on the historical finding situation. There were not any findings from the Middle Ages apart from the saddle portal (we can not exclude its secondary setting). The current form of the tower was built during the Renaissance period. The walls articulation started from the contrast of the basic surface having the rough flat and slightly protruded smooth articulated elements, for example, corner rustic-work, window shams, ledges without demonstrably-found paint layers. Only a part of the tower was decorated with terracotta mascarons of lion heads on all the four walls. In the Baroque period - after particular plaster adaptations - the tower was covered in a grey-and-white-coloured coat of paint and later in a white-and-grey-coloured coat of paint (only fragment findings). At the turn of 19th and 20th century the building was provided with an ochre-and-white-coloured coat of paint. In 2001 the facade was restored carefully and the whole surface was covered in a light ochre-coloured lime paint. In the Middle Ages and Renaissance period the convent was used as a ground-floor building, we can not determine any of its surface adaptations in greater detail. In the early Baroque period an additional storey was built and finished by a plastic top ledge. The smooth basic surface was framed with the plastic corner rustic-work at different length. The original coloured design: white-and-red-and-grey-coloured articulation, a grey-coloured coat of paint, apart from the linear framing of red shams and corner rustic-work, was used in the surface of sunken window plastic mirrors with cut out corners. In 1724 the facade was covered in a white-and-ochre-coloured coat of paint in connexion with the build of a new roof construction and top ledge. In the Classicism period (grey-and-white coloured fragments of paint appeared), the whole facade was covered in a grey-coloured coat of paint in the mid-19th century. Nowadays an ochre-coloured coat of paint has been used all over the surface since the first half of 20th century. The Monastery Area that until now has not been at the center of interest of specialists and large public is one of the most important monuments of the town. The area is marked by a long-time lack of maintenance which issued from a chronic lack of finances apparently since the beginning of this century. Only the interior of the church is in rather good repair. The most valuable elements, the seriously damaged trusses and adjacent ceilings, are being renewed at present. The historical layers of plaster in the exterior are at the edge of extinction. Intentional communist devastation after the abolition of the monastery in 1950 lead to the loss or nearly complete destruction of all the furnishings. The hardly sufficient technical infrastructure of the area is old-fashioned and out of function. A first-rate conservationist renewal of the area and an appropriate use will demand gradual investment of several hundreds of millions of Czech crowns. Monastery of Ritters of Crusader order with red star. The church is used for divine offices; occasionally, concerts are held there. The remaining part of the area cannot be used because of its poor building condition.